(by Robby Soave, Reason .com) – A new study conducted by the Brookings Institution’s John Villasenor, a professor at the University of California-Los Angeles, asked 1,500 students at four-year universities about their views on free speech, and the results are unsettling. Men were more likely than women to say hate speech was protected (51 percent vs. 31 percent.) And while conservative students are often thought to be more in favor of free speech than their liberal counterparts—at least in the present campus censorship wars—the study suggests this reputation is undeserved. Just 44 percent of self-identified Republicans said that hate speech was protected by the First Amendment, compared with 39 percent of Democrats and 40 percent of independents. 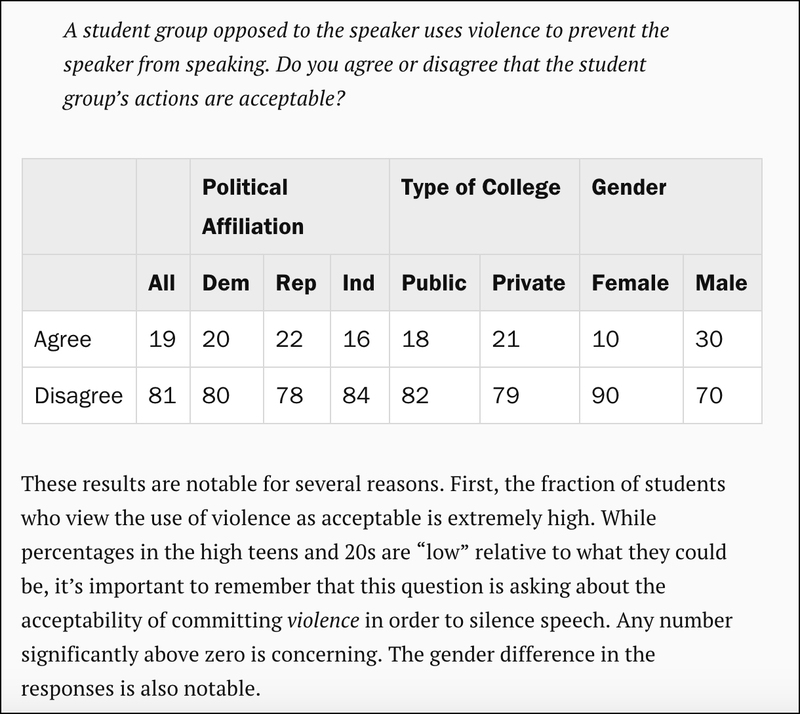 A striking majority of surveyed students—51 percent—thought “shouting so that the audience cannot hear” was a valid tactic for opposing a controversial speaker. Violence was acceptable to 19 percent of respondents. It’s not just a matter of preference, however. 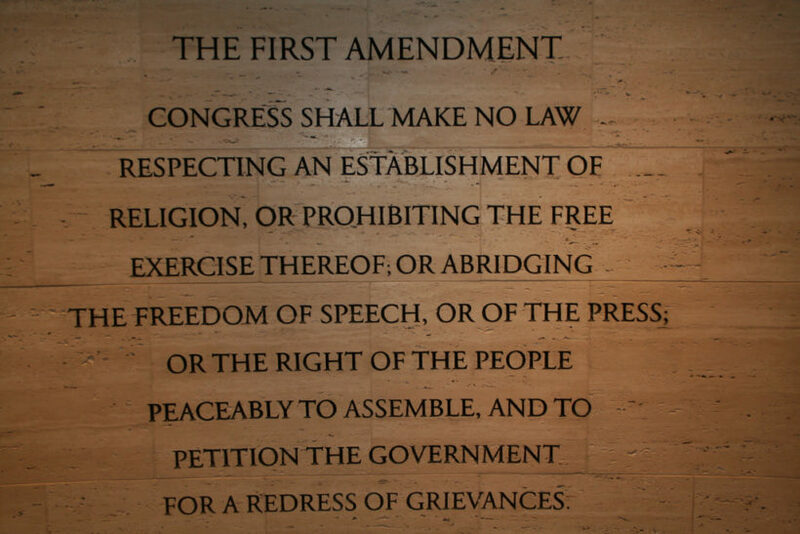 Given that a majority of students incorrectly say the First Amendment doesn’t protect hate speech, or that they don’t know whether it does, we must also consider sheer ignorance as an explanation for the waves of student-led shut downs on American campuses in recent years. Teenagers are somehow making it through 12 years of primary education without absorbing the most basic civics lesson: The founding documents of the United States of America zealously protect people who make offensive statements from censorship at the hands of government officials or violent mobs. Published Sept. 19, 2017 at reason .com. Reprinted here on October 19, 2017, for educational purposes only. May not be reproduced on other websites without permission from Reason. 2. What is your reaction to each of the following points made by UCLA professor John Villasenor about his survey on college students’ views on free speech? “I think that there is insufficient attention given to the First Amendment, and to constitutional principles generally, in pre-college education. Most middle and high school students are taught, for example, that there is a Bill of Rights. But very few of them receive significant instruction on how key Supreme Court rulings have shaped contemporary interpretations of the First (or other) Amendments. Do you agree with this suggestion? Explain your answer.